It’s the last performance night, and people from all over come to fill the seats of Cantrell. Families and friends attend to show support. People are talking in excitement across the aisles, proudly proclaiming whom it is they know on stage. However, when the lights go up, the curtains pull back, and on stage are two lone performers, the crowd falls quiet. Thus begins the show with the audience enraptured. 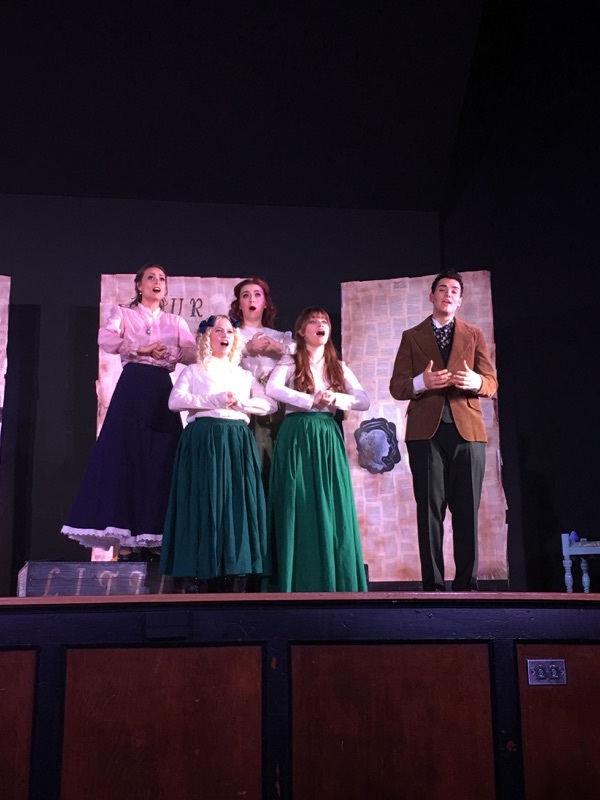 Southern Nazarene University’s School of Music put on the Broadway Musical “Little Women” this past week. To recap the preview article, “Little Women” is a story about perseverance and never forgetting where you come from. It is also a coming of age story by learning to grow from the past and utilizing all the helpful lessons from young adulthood, thanks to friends and family. Even the painful lessons are worth remembering, as they help to build fortification. The March family and friends portray what it means to dream big while remembering the importance of a support system. Since the Wednesday performance, students who went to see the show have loudly stated how much they enjoyed it. Because of the large cast, some of the cast performers alternated. The cast of the last show (Mar. 5) was: Catherine Etter (Jo), Shelby Reust (Meg), MacKenzie McKellips (Beth), Hannah Bell (Amy), Beth Phillips (Marmee), Hannah Kinsey (Aunt March), Noah McGuire (Laurie), Stephen Stark (Prof. Bhaer), Jacob Johnson (Mr. Brooke/Rodrigo), Jacob Velders (Mr. Laurence/Knight), William Dougherty (Braxton), Jessica Cornelius (Mrs. Kirk/Hag), Cassie Halbert (Annie Moffat/troll), Hannah Amos (Troll) and Megan Brown (Hag). Audra Faust was the stage director and Rebekah Ambrosini was the music director. Beth Phillips brought to life the character of Marmee. Her struggles of having a husband off at war and becoming a single mother of four little women was felt throughout the entire theater. Hannah Kinsey’s portrayal of the authoritarian Aunt March was hilarious at times and frightful at others. There was four days of humor, heartbreak, family love and overall amazing talent! It was a diverse cast of first time SNU performers and veterans up on the stage, bringing life to this classic story. When the curtain went down on the last scene, the audience stood up in a standing ovation. Loud cheers, whistles and applause was heard from out the open doors of Cantrell. People came spilling out of the building singing the praises of the cast and show. I can’t wait to see what the School of Music presents next year!